Seriously? OMG! WTF?Kevin Hart Archives - Seriously? OMG! WTF? 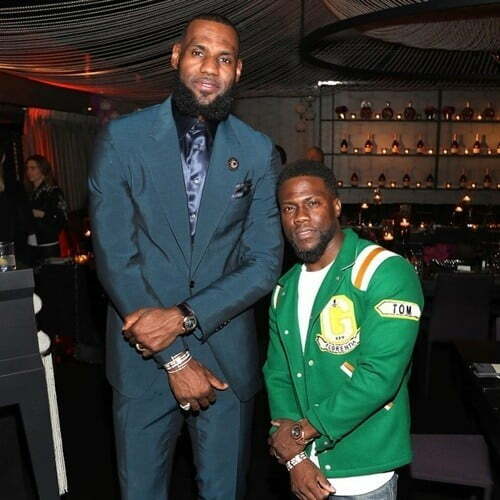 Kevin Hart says he is still growing! How much do you want to bet that somehow The Rock messed with his height tracker so that Hart thinks he is taller. Either that or someone put some sort of lift his shows. I hate to burst his little bubble, but he has not grown. Unless he was using one of those stretching torture devices and they only break your bones. Ever since I saw Kevin Hart take a Lyft with Ice Cube and Conan O’Brien, I thought he was funny. I like the way he plays off of Cube and later with The Rock. Even though, I find his movies are painful to watch. Then his old tweets came back to haunt him. I thought he did the right thing by stepping down from the Oscars. That was the last thing he did that was right. He went onto Ellen DeGeneres’ show last week and played the victim. He is not the victim. All he needed to do was show remorse and this would have been over. Instead, he acts like he is the one that is wronged and he is angry that his dream of hosting the Oscars was taken away from him. But it not all about him. It is how his words hurt a lot of people. Today, when he was on Good Morning America, Michael Strahan asked him about the tweets again. The talk show host was doing everything he can to help Hart get out of this mess that he made so much worse, but the actor did not bite. Instead, he doubled down with anger and said he is over it and will not address the situation again. Like that will happen? Next press opportunity, they will ask him about it again and again. When Strahan asked him if he can understand why people are upset by his tweets, he said if people can’t see that he comes from a place of love then he does not have time for them. Well, Kevin, I don’t see it so I am done with you. You need to get over yourself because people don’t forget. Go see a crisis management publicist because this will not go away as long as you keep acting like someone with a Napoleon complex. Translation, a small man with a huge ego. This is going to follow you around, the same way the past still haunts Hugh Grant, Charlie Sheen and Michael Richards. You yourself are hurting the success of The Upside, There could have been upside for you had you just shown some remorse. You didn’t and I am sure you lost a lot fans besides me. Think about that when you see a hit in your sales. Ever since Kevin Hart resigned from hosting the Oscars, he has not done any press. Now that he has a movie coming out next week, he is back doing the talk show circuit. His first stop was Ellen and Degeneres talked to him about homophobic tweets. Well, not DeGeneres. That is because she called the Academy and asked them to give Hart the hosting job back. They told her they wanted him back. At first, he was hesitant, but then he told the host he reevaluate his decision. Even though the Academy said they would take him back, no word if ABC will. That is because they fired James Gunn and Roseanne Barr for the same thing. Although, Gunn’s case is much closer to Hart’s and he did not get his directing job back. Gunn jumped studios. Therefore, I do not think Hart should host the Oscars. I am saying that even after lobbying for him to get the job for nearly two years, with The Rock. Now, when it comes to him whining about having to apologize over again. It is part of the job. Hugh Grant, Rob Lowe, Charlie Sheen and Christian Bale have to do it, so does Hart. You don’t want to become a Michael Richards. Remember him? I think Hart needs to get a crisis management publicist to help him. Then he needs to talk to African-American gay men to understand why his tweets are so harmful to them and their community. How do you think Hart did during the interview? On Tuesday, Kevin Hart was named this year’s Oscar host. Almost immediately, some of his old homophobic Tweets came back to haunt him and people asked for him to be ousted. Including the Academy. The actor says they told him to apologize or they were going to have to search for a new host. He refused to do it because he claims he has apologized for those old tweets in the past. He also says he is not the man he used to be. He had no choice and neither did Academy and ABC. After all, the latter already fired Roseanne and James Gunn over past tweets, so they could let him off the hook if they didn’t let the others. When it comes to who should replace him, they probably go with Wanda Sykes. She is an African-American lesbian who appears on an ABC show. But I would love if they went with Rob Lowe. He needs redemption after the last time he was part of hosting the Oscars. Actually, I would prefer no host and no montages that are a waste of time; but we know that is never going to happen in our lifetime. Oh and I love you Billy Crystal, but I think your time has passed. Who do you think should host the Oscars this year? Remember in History of the World Part 1 when Madeline Kahn said no to all of those soldiers until she said yes? Well, it was the same thing with this year’s Oscars. Except the people that they were asking to host Hollywood’s big night were all saying no. I think they made it a good call. It just would have been a better one if they could have gotten The Rock to do with it him. Since I have been saying for the last three years that they should be the ones to doing it together. Plus, the Academy got lucky getting him because they need a big name to MC the night. That is because the movies people want to get nominated (Black Panther and Crazy Rich Asians) will not and the ones they never heard of will. There has been absolutely no Oscar buzz and it is already December 4th. When did Dylan McDermott go bald? Did Jennifer Garner really turn 47 today? The Denver Zoo welcomed a baby sloth! Is Luke Bryan losing it on American Idol?